When people think of journals, they imagine dated and dry publications, dense with content, muted colors, and standard fonts. Perhaps this is perpetuated by a need to feel serious and academic. But if you consider the readers, a journal should be something inviting and easy to read. The design should help them navigate the pages and take away what is relevant for their jobs. 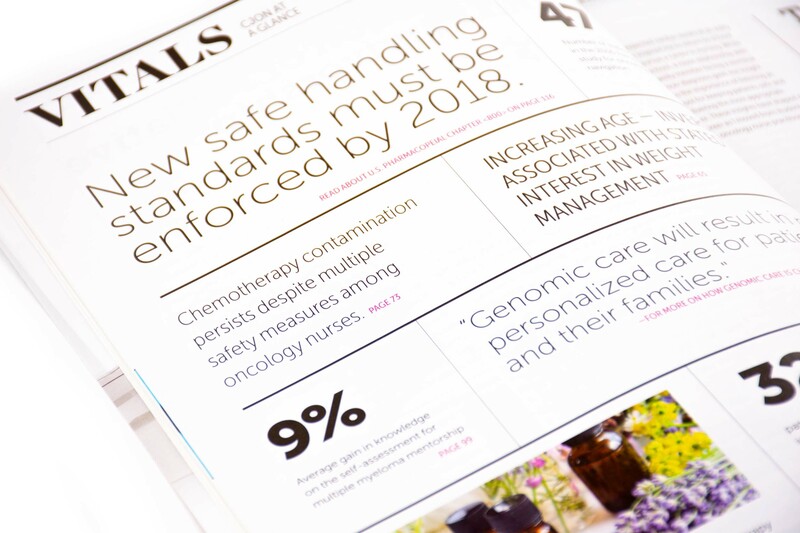 We were selected to redesign two Oncology Nursing Society publications, Clinical Journal of Oncology Nursing and the Oncology Nursing Forum. The publications were like most journals: dense with content, dull and inconsistent color scheme, and peppered with icon-sized stock imagery that added no value to the reader. Through our research we discovered the audience is primarily educated women seeking continuous learning in their field. Readers keep issues for long periods of time in order to absorb the material. During our intake, we learned that the Clinical Journal of Oncology Nursing was most often referred to as “CJON,” a quick alternative handle. We recommended exploring a name change as part of the redesign. By changing the name to CJON there would be a direct connection to the online version cjon.ons.org, and this would allow the society to be more strategic in their print/digital plan. In contrast, Oncology Nursing Forum was a research publication that needed to retain its formal name. For CJON we also recommended the creation of new departments to bring better pacing into the publication. A page called “Vitals” was introduced in the front of book to give a busy reader some highlights of particularly relevant articles they could find in the publication. “Clinical Moment,” another bookend department, is a place where members can submit questions and get direct responses and additional resources from field experts. 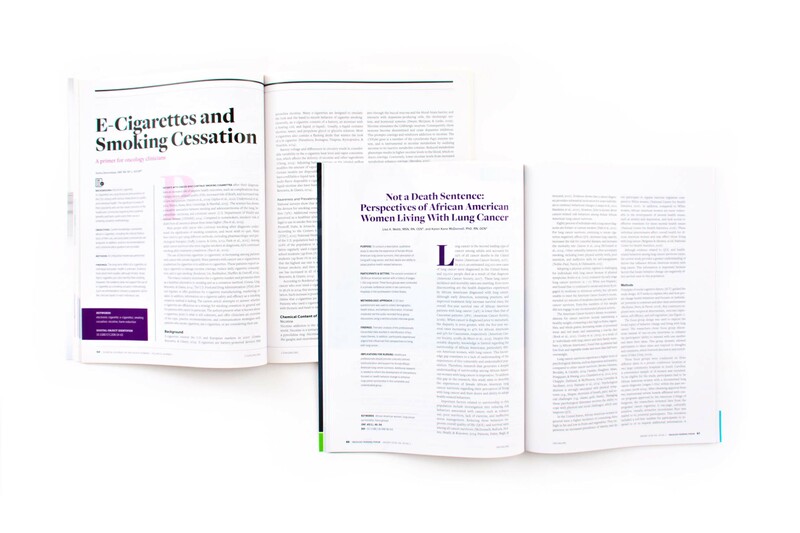 We eliminated the use of stock imagery within both publications and let elegant typography take center stage. The font palette we selected included bold yet friendly fonts for the display and a highly legible font for the body copy to increase readability in the text. The overall result are publications that is inviting and comfortable to read. All of the fonts were selected from Adobe Typekit allowing ONS to utilize them with no additional line item on their budget. With the removal of imagery within the publication, we recommended that ONS use their entire art budget on the cover to commission an illustrator. 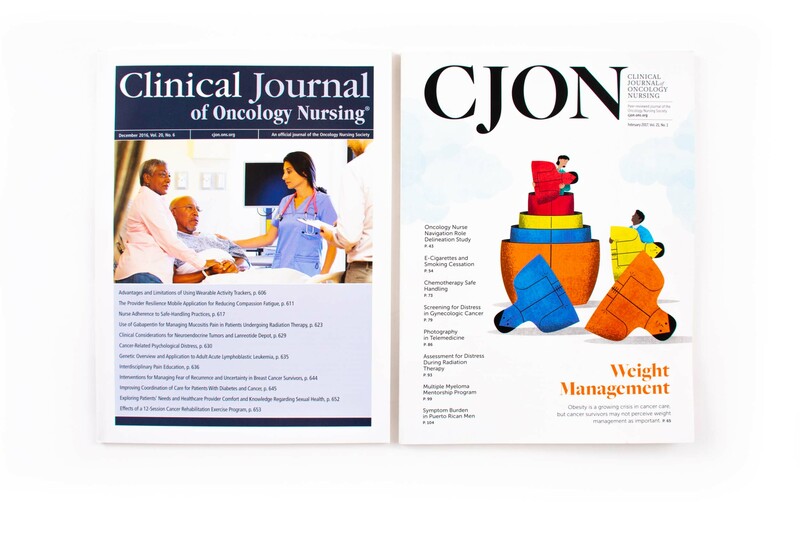 Each cover of CJON has a unique illustration to highlight a featured article, making the journal feel fresh and different from issue-to-issue. For Oncology Nursing Forum, an illustrator is commissioned to create abstract artwork based on research images for all six covers of the year. The ultimate result is two fresh publications, each with a long shelf-life, that readers want to show off, delve into, and share with their colleagues.